I’m posting my March reading review in May, because I’m a terrible blogger. I could sit here and bore you with all the reasons why I haven’t posted a single blog post in over six weeks, but I’m sure what you care most about is what I’ve been reading during my absence. My April post will be following shortly, so enjoy a double hit of bookish goodness. Silent Scream by Angela Marsons (audiobook). So this was an interesting book and while I did enjoy it, it was reasonably clear in many stages that this was the first book in what’s expected to be a long series. D.I. Kim Stone is an intriguing character and her intelligence and dedication was absolutely needed to stop a ruthless killer. I liked getting to know D.I. Stone but I won’t be rushing out to read her next adventure. The Obsession by Nora Roberts. Nora Roberts’s annual standalone romantic suspense novel is always one of my most anticipated books of the year, and The Obsession was one of the strongest of Nora’s novels in recent memory. Naomi Bowes suffered a traumatic event as a child and has reinvented herself as Naomi Carson. No matter what she does, though, she will always be the daughter of infamous serial killer Thomas David Bowes. As usual, there’s a brooding and handsome love interest and a troubled past that inevitably catches up with our heroine, but I was completely invested in the story and knocked it over within 24 hours. 2017’s novel can’t come fast enough. Like I Can Love by Kim Lock. Hot damn, this was a brilliant novel. It’s touted by the author as domestic noir, and I couldn’t think of a better way to describe it. In it, Fairlie Winter’s best friend Jenna commits suicide, and the novel alternates between Fairlie in the present trying to make sense of what happened and Jenna in the past leading readers up to the moment where she ultimately takes her own life. This book was unsettling and deeply moving, and caused me to question many moments from past relationships. Kim Lock makes you reexamine what you think you know about the people around you in the best possible way. Baby Doll by Hollie Overton. I was on a roll with crime novels, and this one was unique. Normally, abduction novels end with the victim either a) finding freedom or b) dying. Hollie Overton’s novel begins with a victim finding freedom, and the story centres on what happens next. It’s not really something you think about, the ‘what happens next’ part, and Lily’s struggle to reconnect with her family after escaping is difficult and intense to read. It’s overly dramatic, of course, and the multiple viewpoints can make it a frustrating read at times, but overall the book was entertaining. Stars of Fortune by Nora Roberts. 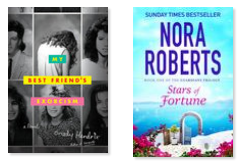 I was on a Nora bender in March and sadly Stars of Fortune was a bit of a let down. I’ve really loved some of Nora’s paranormal trilogies in the past, but this one paled in comparison to Nora’s earlier work. The pairings and premise were somewhat ridiculous, even for a paranormal romance. I’ll probably finish the series because it’s Nora, but I won’t be thrilled about it. My Best Friend’s Exorcism by Grady Hendrix. This was super weird. I think I liked it? Abby and Gretchen are best friends, but when they’re 16 Gretchen starts to act in strange and bizarre ways. In my opinion, it took Abby far too long to properly question Gretchen’s odd behaviour, but when she finally does get there she’s the most loyal friend you could find. The adults in this book were completely ridiculous, and their inability to do anything helpful whatsoever was maddening. Overall this was a fun read and I now intend to track down Grady Hendrix’s first novel. Overall, March was an alright reading month. Do you want to know a secret? April was better.